TRANSLATION INSTRUCTIONS: Please use the translation feature on this blog to translate this entire site into your choice of 56 different languages. Then copy and paste this entire page (or parts desired) into another document on your computer. Then you will be able to save it and/or print it for future use. This is a summary of the sequence of prophesied events that take place after The Great Warning leading up to the reign of the antichrist. It is based on heavenly messages found in the Book of Truth given to 7th Messenger and End-Time Prophet, Maria Divine Mercy. The heavenly messages relied upon follow after the summary. There will be an escalation of lesser wars culminating into a Great War (WWIII) in the Middle East. A power struggle between Egypt and Syria will draw the four big empires — U.S., Russia, Europe and China into a final battle centered in Israel. Israel will suffer a genocide worse than WWII. Millions of people will be killed and many nations will be involved through alliance with the four big empires. Nuclear weapons will be used. When wars are raging everywhere and all seems hopeless, the antichrist (“man of peace”) will suddenly appear on the world stage in Jerusalem and negotiate a peace treaty in which Israel will give up its sovereignty in an unlikely alliance with Palestine. Then the antichrist will move at a quicken pace in negotiating peace agreements in many war-torn nations. Very soon afterwards the antichrist will become involved in philanthropy and he will link up the main world banks to create a new, powerful, financial institution called “Babylon”. In Holy Scripture, the beast with the ten horns “Babylon” is the European Union; the “Bear” is Russia and the “Red Dragon” is China. All will be told that “Babylon” is to glorify the great one (God), promote the environment/mother earth, and rid the world of poverty. All four big empires will become connected in this one world union “Babylon”. Christians and Jews will be targeted and persecuted by the antichrist and his followers in a “political state-church” that will rule with a communistic-like control (“Dragon”). The mark of the beast will control all money, all access to food, and all places where people live. The mark of the beast will have “666” embedded into a microchip that will be taken like a vaccination in the human body. The mark of the beast will cause spiritual death of the soul and also a terrible physical disease (plague) designed to reduce the world’s population. When “Babylon” is fully formed, God will intervene by tilting the world on its axis and throwing fire upon one third of the earth to warn His children of the consequences of embracing the greatest abomination conceived by hell. Then a great famine will take place, but it will not be caused by God, but by the deliberate contamination of the earth by the antichrist. Sexual immorality will increase as the Battle of Armageddon intensifies. Nakedness will become acceptable in public, as well as obscene sins of the flesh in public places. Abortion up to the day of delivery and murder even among children will be so common in society that many will become immune to any feeling of compassion. Once the antichrist appears in public in Jerusalem, at the same time, everything in the Catholic Church will change quickly. There will be an event where the false prophet will be seen at death’s door, but he will recover and many people will be fooled to think he has been “miraculously” healed and favored with great, supernatural powers from Heaven. Many people will believe that the miracles of the false prophet are taking place to herald the Second Coming of Jesus Christ. The antichrist will be involved in the decision-making to launch a new one world religion. The false Catholic Church will publicly call for the unification of all religions. The false prophet will control all religions in the world and prey on the love of those who know the Truth. Hundreds of thousands “false prophets” will arise, endorsed by Church leaders, promoting a new missal (New Age/satanic), with the objective to prepare the world with great anticipation for the Second Coming of Jesus Christ. Grave errors will be revealed by them in connection with the Book of Revelation. The main biggest lie they will promote is that Jesus Christ (“Son of Man”) will appear in the flesh and walk among His people and will raise them up on the last day. The True Christian Church will be thrown out of Rome and endure a number of years of desolation. Mortal sin will be declared no more and the Sacrament of Confession will stop, because many will believe that all people will be forgiven by God and so all will enter the Kingdom of Heaven. All pagan festivals and satanic ceremonies and rituals will be integrated into the false Catholic Church seen as a “holy communion” between all religions. It will be hard for the Remnant Church to remain faithful because they will be pressured by the great celebrations, ceremonies and rejoicing preceded by the antichrist to welcome him into the false Catholic Church. People will applaud the new one world church saying it is a great miracle created by God. The antichrist will show great honor to the false prophet and many people will applaud the alliance between politics and religion. When the great deceit is recognized, many priests will become so fearful, they will leave the service of the Church; hundreds of thousands will be excommunicated for failing to obey; and others will be martyred. At this point, holy priests will need to seek out refuges to lead the True Church in secret where they can provide the daily Mass and Holy Eucharist until the last day. To gain legitimacy among Catholics, the image of the Mother of God and the prophecies of Fatima will be deliberately used to promote a false sense of security. The sign that the antichrist is about to be seated on his throne in Rome will be the Tabernacles will be replaced by wooden versions and the Holy Eucharist will no longer be present in the false Catholic Church. There will be a lavish coronation held to seat the antichrist on the throne of the one world union. The antichrist will declare he is a devout Christian and will use Holy Scripture in his speeches to impress people with his knowledge. Every Word in Holy Scripture regarding the Second Coming of Jesus Christ will be adapted and twisted backwards to convince the world they are witnessing the return of Jesus Christ. The antichrist will be a master of many languages which will be used to bring unity among people quickly. The antichrist will not speak Latin. Weary Christians will be relieved to see the antichrist because they will think he is “God-sent” and an answer to their prayers. The antichrist will lie that he is Jesus Christ by declaring he has come in the flesh “finally” at this time. It will be impossible for the antichrist to allude to the real Jesus Christ Who came in the flesh by His death on the Cross–the antichrist will declare the fact in reverse. The antichrist will use the stigmata to convince people that he is Jesus Christ. The antichrist will work many great “miracles” where he will cure the sick and terminally ill.
A series of false apparitions, in which the image of the sign of the Holy Spirit will be seen, will appear everywhere, which will mock the supernatural sign left by God at true Marian apparition sites like Medjugorje and Garabandal, etc. The antichrist will have a hypnotic appeal that will cause people to worship him. The antichrist will say that his elevation to the top of the false Catholic Church is the sign of the Second Coming. The false trinity is satan, the antichrist, and the false prophet. In the end, through satanic rituals, the antichrist will be seen to ascend into Heaven. The real Jesus Christ will be seen descending upon the clouds–the reverse of when He ascended into Heaven–just as He promised. The antichrist and all his slavish followers will be thrown into the lake of fire. My dear child, I must, on the instructions of my Son, Jesus Christ, reveal that the wars, which will unfold now, in the Middle East, will herald the great battle, as a new, bitter world war will be declared. How this breaks the Sacred Heart of my poor suffering Son. The hatred, which infuses the hearts of those leaders, entrusted with the responsibility of running their countries, by ordinary people, will spread. They will betray their own nations. Millions will be killed and many nations will be involved. You must know that the souls of those who will be murdered and who are innocent of any crime will be saved by my Son. The speed of these wars will escalate and no sooner will four parts of the world become involved than the Great War will be announced. Sadly, nuclear weapons will be used and many will suffer. It will be a frightening war, but it will not last long. Pray, pray, pray for all the innocent souls and continue to recite my Most Holy Rosary, three times a day, in order to ease the suffering, which will result because of World War III. Thank you, my child, for responding to my call. Know that there is great sadness in Heaven at this time and it is with a heavy heart that I bring you this difficult news. My dearly beloved daughter, much will happen in the world as the power of the false prophet rises and anyone who dares to challenge him will be ignored, even in the highest places within My Church. Political disagreements will result in four parts of the Earth. Four powerful empires will emerge as the main source from which wars will be surmounted. As these empires increase in power, they will control many parts of the world, but not all, as this would not be permitted by My Father. Each of these nations will fight amongst themselves, although they will claim to be working together. As mistrust builds, they will each try to outdo the other and then the fighting will bear forth. They will destroy many parts of their poor nations. The people over whom they will govern will have little power left, where democracy will hang like a thread. It is these innocent and suffering people who will be given the Protection of God if they have the Seal of the Living God. Never underestimate this free Gift from God. The Seal of the Living God will protect you from physical and spiritual death during wars. Please get this to as many people as you can in every nation. Egypt and Syria will be embroiled in a power struggle, which will have repercussions for Israel. The enemies of the Jews are many. All wars which target and involve these two countries will result in a final battle, which will involve Israel and they will suffer the worst genocide witnessed since the Second World War. The demise and rise of Jerusalem is foretold and these battles must take place before the prophecies are fulfilled. My dearly beloved daughter, the four parts of the world I refer to are the four big empires – the US, Russia, Europe and China. All prophecies foretold will involve these powers, around which all the upheavals in religious and political structures will occur. Syria and Egypt, through the unrest in their countries, will become the catalysts for a greater war, which will involve the four great powers. Each of these powers will be connected in order to create a unified regime, which will be used to control the global wealth and population. The religious war will be central to this control and the appointed leaders in My Christian Churches will be overcome and destroyed in preparation for the beast, who will control all four empires. None of the rulers, who defy the Word of God or who try to destroy His children, will be given the authority by God to take, by force, those whose names are in the Book of the Living. 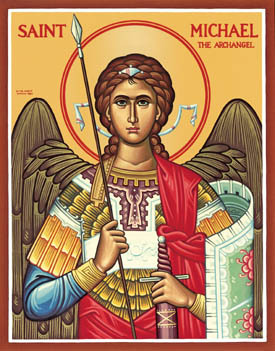 And while I speak of Christians and the need for them to remain true to Me, I also refer to the Jews because their protector, Michael the Archangel, will watch over them and help them to withstand the persecution which they, as God’s chosen people, will also have to endure. God’s Plan has been created and all the angels and saints in Heaven prepare now, to help Me in My Mission to unite all and protect those who love Me from the great deceit, which has been created to fool the world. Never before has the wickedness against God been so co-ordinated by the human race as it is today. Never before has mortal man been capable of inflicting so much suffering, through the seizure of power in order to control, as it has at this moment of time in history. The great persecution against God’s children, created by Satan with the willing support of evil, power hungry men and women, in positions of great power, is unfolding before your eyes. Yet, many of you cannot see because you have been fooled. My dearly beloved daughter, the time for the prophecies foretold in the Old Testament regarding the fate of the Jews is to become evident shortly. The Jews who rejected the Covenant of God, laid down by Moses, will suffer as they have done for centuries. Their power over the land of their forefathers will be taken and the only solution will be to sign a treaty where they will become slaves to the antichrist. My chosen race will suffer, just as I did, and little mercy will be shown to them. The treatment of the Jews will be worse than that shown to them during the genocide, which took place in the Second World War. It will be in Israel that the Tribulation will be seen, as foretold, clearly. It will be because of Israel, that wars will escalate, when it will become difficult to determine who the real enemy will be. The peace treaty will be signed soon afterwards and the man of peace will enter the world stage. The beast with the ten horns, that is the European Union, will crush all traces of God. Now is the time to prepare for their cruelty, which will be unprecedented, when it will come to the abolition of Christianity. How proud they will be when the little one, hidden amongst them, will rise and boast of his power. They will applaud the appointed leader of a new church and his power will spread over the world. This will develop quickly and to those sacred servants of Mine, who do not accept the Truth of this prophecy, you must know this. Should you conform to the new laws of Rome, a city, which will be seized by the liar and servant of the antichrist, you will become a prisoner of this new regime. When you see the Sacrament of the Holy Eucharist being amended and changed beyond recognition, know that this will be your chance to turn your back on this wicked regime. My Church is infallible. It will remain infallible. If others, however, within My Church, rebel against My Teachings and change the Holy Sacraments they will be cast away from My Church. The new regime, not of God, will be fallible for it will not represent the Truth. Only My Teachings can be adhered to by Christians. If you follow a man-made religion you cannot call yourself a Christian. Anyone who says that My Church is infallible is correct. Anyone who claims to belong to a new church, where My Teachings have been tampered with and where My Sacraments have been abolished, will be living a lie. This will be a very difficult time for My sacred servants, for they must follow the Laws laid down by My Church. I say to you now that you must still do this. But, as soon as My Sacraments have been desecrated, only follow My True Church. By then only those servants who follow the Truth can claim to lead My people according to the instructions laid down by Me during My time on earth. The rise of paganism will sweep over the earth and in its wake a false sense of peace will be created. Then you will see the rise in the adulation of celebrities and a fanatical devotion to new age spiritualism and satanic worship, disguised as modern psychological therapy. This is where worship of oneself will be the most important trait to strive for. Abortion and murder will be so common that many will become immune to any feeling of compassion for those who are vulnerable. It will be during this time that My army will continue, undaunted, in their mission to save souls. Nothing will stop them and for every hour of their prayers I will mitigate much of this suffering in the world. To the Jews I say this. You have suffered because of your failure to listen to the Word of God through the prophets. You, however, will finally accept the True Messiah soon. Then you, too, will join My Army as it marches towards victory against the antichrist. You will suffer just as I did for this has been foretold. The House of David will have its day of victory on the day I will raise up the New Jerusalem out of the ashes. As My New Kingdom emerges the king of the pagan world and his servants will be turned into ashes. My Promise to come to bring you to My Father’s Kingdom is close. To you I pledge My Love and My Loyalty, as your promised Messiah, promised to you so long ago. This is your inheritance. You did not reject Me, your Jesus when I was crucified. You rejected God. I Am God. I Am the way for you to enter the New Paradise. Accept My Hand for I love you, I forgive you. You are My People and I Am coming for you. My dearly beloved daughter you must not be frightened by these messages. For they are being given to the world because of the love that I have for the whole of mankind. Knowledge of events to come will help prepare My children so that they can defend the truth. My warnings can help spread conversion and will enable My children to, once again, acknowledge the truth of My promise to come back again. My Second Coming will take place in your lifetime children. You, of this chosen generation, will reap the wonders of My Glorious Reign on earth. I include among you, my chosen children, those who have turned their backs on Me and deny the existence of My Beloved Father, God the Most High. My love will envelop those who despise Me. In time they will convert. Acknowledging My messages given to you, My end time prophet given the responsibility of the opening of the seven seals, will not be enough. What really matters is the salvation of all your brothers and sisters in the world. The two allies Russia and China will join forces. This will happen as the beast with the ten horns rises to dominate their long suffering innocent people. The beast with the ten horns is the European Union, My daughter, referred to as Babylon in the Book of Revelation. Babylon will fall and be dominated by the big Red Dragon, China and its ally the Bear, Russia. When this happens communism will rule and woe to anyone seen to practice their religion in their presence. All religions will be banned but Christians will suffer the biggest persecution. Roman Catholics will not be tolerated at all and they will have to hold masses in secret. The time has come, children, all My followers, to start planning your future. I will guide you at all times. Start preparing now because you will be given the time to do this. Again, I say to you, prayer and much of it will dilute the power of the Beast, the Bear and the Red Dragon. They will rule for a very short time. For after that they will be destroyed. My dearly beloved daughter, the world is on the brink of many wars and these will have many repercussions on the speed by which the Church will erupt. It will be during any final peace negotiations, which will take place after much carnage and destruction, that many people will feel helpless, alone, fearful and without any real leadership. It will be because of the weak links in the political world that the world will be at its most vulnerable. Because of this, there will rise a fearful army, the likes of which will never have been seen before. As the world will fragment, so also will many churches. Then when all seems hopeless, a unified group, consisting of political leaders and Christian Church leaders, will be created under a one-world organization – out of which will sprout a new abomination – a new one-world religion. All of these events will take place in stages. Your duty, My beloved followers, is to Me, as I guide you, for there is only one road to peace and safety and that is through Me, Jesus Christ. I will guide you through the thorns, the pain and the horror of the abomination of desolation. You will be safe when you cling to Me. Be strong, My beloved daughter, during these difficult trials, for it will be through your strength and courage that I will be able to show the Way of the Truth, when the world is turned inside out, because of the wickedness brought about by the love of power and corruption, which will bring about these wars and then the Great War. Move quickly and ensure that you dedicate your lives to prayers and for the protection of My Church on Earth. My Gifts will protect each of you and I will always respond to those who seek Me out, in this time of great turmoil ahead. When these events unfold, My Army on Earth will swell. Those who oppose this Mission will follow Me, for by then they will no longer be able to deny the Truth – when they find that they, too, will suffer the persecution to be faced by Christians everywhere, when they have to endure the reign of the Dragon. Their only hope will be to follow Me, their Jesus, at that stage, for only through Me will they be able to come to My Father’s Kingdom. My dearest daughter, the world must prepare for the arrival of the greatest enemy of humanity since My children were placed on this Earth. The antichrist is now ready to reveal himself and his plan is this. He will wait until wars rage everywhere. Then he will step in and create a false peace in the state of Israel by joining them with Palestine in an unlikely alliance. Everyone will lavish praise on him. He will not stop there, for he will move at a pace which will astonish many and he will negotiate peace agreements in many war-torn nations. Again, he will be praised and then be admired, with an extraordinary devotion by billions all over the world. Then all will seem well. Very soon he will become involved with philanthropy and he will link up with the main world banks to create a new, powerful, financial institution. Many businesses and political leaders will become embroiled with his many plans. Soon a new monstrosity will be created, in the name of kick-starting the world’s economy. This will be the new Babylon, the centre of all power, from which the world’s elite and rich will trade. It will be seen to be the source of great news, so that people will benefit in every way from jobs, to the homes they live in and to the food they feed their families with. All glory will surround the antichrist. Then he will, along with the false prophet, create a global partnership, which will be presented as the greatest humanitarian initiative. The world will applaud this new Babylon and everyone will clamour to try and gain even just a tiny foothold within its centre. The new Babylon, all will be told, is to glorify the great one, to promote the environment, to embrace mother earth and to rid the world of poverty from the riches, which will pour from its vile mouth. When this takes place, the Hand of My intervention will turn the world on its axis. I Am not going to stand by without warning My children of the consequences of embracing this abomination, created in the depths of Hell and inflicted upon humanity. My great signs will be given to show all those who embrace and accept this insult in My Holy Name. I will shake the world and it will tilt. No man will be able to ignore My intervention. Then I will throw fire upon one third of the Earth. Soon, famine will be seen, but not by My Hand – it will be by the deliberate contamination of the Earth by the antichrist. As he and his cohorts inflict wickedness upon unsuspecting people in many nations, I will strike back. While this suffering will be hard to endure, have no fear, children, for it will be short. My Love is great for all of you, but My Justice is swift and My punishment great. You must not accept what is brought before you. When you see the man of peace, the antichrist, receive accolades and awards for his great works in war-torn countries, know that My Intervention is close. You must remain in union with My Son, Jesus Christ, at all times and pray that the Sacraments will be made available to you by loyal priests and clergy during the times of trials which lie before you. My Will, will be done. Nothing can, nor will, stop the Final Covenant where My Son will Reign in Peace from being fulfilled. My dearest daughter, My Divine Powers are given to all of My children who turn to Me, asking Me – through My Son – to sustain them during these times of great trials on Earth. Sin is so rampant that My Son now suffers the same Agony, which He endured for each of you on the Cross. Sin is so widespread that you have all become immune to it and the evil which it breathes. My children, you must come to Me and never give up your quest for peace and love. Never think that I will not hear your voices, as they call out to Me, no matter how little you are. My Son’s Second Coming will create great havoc, division, mistrust, hatred and sadness, as the Truth of My Holy Word will be thrown to one side. Satan and his demons have recruited a very large army – an army so big and powerful that it would be beyond belief if you could see how it has been formed. This army controls what you, My children, are being told in public. Very rarely, from now on, will you be told the Truth. By this I mean the Truth, according to My Most Holy Covenant. All matters relating to the world in which you live will not be truly revealed to you, as wars, deliberately created to destroy My people, will soon be witnessed. None of these wars will be for the good of man nor will they be just. My Word, given to the world, since the first prophet revealed My Desires, will no longer be taken seriously. The Word, according to My Son, Jesus Christ, will be abused and defiled in order to justify lies. It is time for all those who are called to the service of My Son to remain alert. You cannot ignore this, My Call to humanity. I, through My Son, ask you to stay together, in union with Him at all times. You, My children, are Satan’s first target, as he will not rest until he seizes My Son’s Church on Earth, first. Without My Son’s Church, he will fail to draw the souls he craves the most. You, My children, will be hurt and tormented by the beast – the antichrist – if you cave into pressures which force you to embrace the new false doctrine, which is now being carefully and ruthlessly prepared. I, the Father of all of you, God the Most High, wish it to be made known that the antichrist is about to be embraced by My enemies in secret rituals. He is being sworn in behind hidden walls, in places, which are meant for the Adoration of My Son. The ecclesiastical masonry, which will now be witnessed, plays an important role in this abomination. Sadly, all of this must take place before My Covenant to gather all My children, back into the Paradise I created for them, in the first instance, is completed. It will be up to those of you, chosen by Me, to always acknowledge the Truth, so that you can help My Son to save the other souls who will swear an oath to follow the beast. My Son’s Image, common throughout the world, will soon be replaced by the image of the false prophet. His image will be adored first, instead of that of My Son. Then this will be followed by large images, in every kind of format, of the beast, whose sign 666 will be embedded within every single mark he makes upon an unsuspecting world. You will see this sign hidden in such wicked objects, which will be used just as one would carry holy objects. A form of rosary beads will be created to idolise the new, soon to be declared, union of the world’s churches. The new world religion will be celebrated by the taking of holy prayer books, medals, scapulars, rosary beads, Crosses and desecrating them into becoming good luck charms. Everyone will love the antichrist, as he will represent the world outside of religion, on the one hand, but because he will be embraced by the false imposter in My Son’s Church on Earth, he will be seen to represent all that is sacred in the world. My children, do not let news of these events tear at your heart, for when you listen to Me, and follow the Path of My Son, I will spare you much of the persecution of spirit, which is to come. Your adherence to these Messages will be weakened from time to time, by attacks planted by Satan. Some of you will walk away. Some of you will doubt. The vast majority of you will remain true to Me and I will grant you great Favours and Graces for your obedience. I love you children. I will be merciful and when you ask Me, through My Son, to soothe your hearts and help you to remain at peace and walk with confidence towards the Gates of My New Paradise, I will answer your call. My dearly beloved daughter, My Name is rarely mentioned in the same breath, as those who claim to represent Me shout blasphemies against God. My death on the Cross will not only be dismissed and not spoken about, but the images of demons will be used as a substitute for My Corpus on the Cross. If it is not Me they killed on the Cross, then who is it? Who are they, who proclaim My Word to the world, but who utter profanities, which spill from their mouths? Beware of the miracles the men in white robes will claim to perform, as if they are made of My Flesh and blessed with My Spirit. When you see wondrous and seemingly miraculous events take place, know that they are nothing of the sort. You will be told that miracles have been created by the hand of the false prophet. You will then be expected to show great respect and you will be told, at first, that he is a living saint. He will be worshipped, loved and admired and all will say that he is favoured by God. They will believe, in time, that these miracles are taking place to herald My Second Coming. And then, the beast will appear. And he will honour the first one. And the world will be caught up in terrible confusion. They will be trapped. On the one hand, the false prophet will control all religions in the world and prey on the love of those who know the Truth. Those who do know the Truth, will not reject Me, for theirs is the Kingdom of God. The antichrist will show great honour towards the false prophet. But, because his role will be a political one, their allegiance will unite many people who will applaud this alliance. These events will begin to make sense soon. Those who try to take you away with them into a false faith, not of God, will be very convincing. They will never reveal their true intent, until they believe they are winning this battle. But then, they will destroy many, who refuse to accept the mark of the beast. They will say that this will be a sign of true world peace, love and unity, but hidden within its vile core will be the number 666, the sign of the beast. Just as holy medals offer protection from Heaven with Power from God, the mark of the beast will bring with it death – death of the soul and death by a terrible disease. Those who refuse it will have to hide and prepare. I know this is frightening, but it is true. I will intervene with the help of your prayers to put an end to the persecution. You, my beloved followers, who know the Truth, are being prepared to help those who will struggle with this knowledge. By the time this happens, My Remnant Army, will be a force to be reckoned with. Their strength will lie in their ability to save those who will suffer by this diabolical act of revenge on God’s children. My dear child, it has been foretold that many false prophets will arise and that, during this time, they will spread untruths about the Word of God. They will arise in their hundreds of thousands and be endorsed by those who claim to represent my Son’s servants. They will preach in small, as well as large, groups and you will know them by the false prophecies, which they will reveal to the world. They will be seen as very holy people, and some will say that they have great healing powers of the flesh as well as the spirit. Some will wear the garments of holy men and they will promote a new missal, which will deviate from the Truth. Many people will be confused by their teachings, as they will mix their false claims with part of the Truth. One of their objectives will be to be seen to prepare the world for the Second Coming of Christ and they will create great anticipation of this event amongst my Son’s followers. But, it will not be my Son, Jesus Christ, they will be preparing God’s children to welcome. No. It will be the antichrist. Grave errors, will be revealed by them in connection with the Book of Revelation as they will twist the contents of this Holy Book. Few will know that they are being fed lies and the greatest untruth, which they will proclaim, will be this. They will say that Jesus Christ, the Son of Man, will make Himself known in the world soon. That He will come in the flesh. That he will walk amongst His people and that He will raise them up on the last day. This could never happen for my Son, who came in the flesh, the first time, through His Birth, will never come in the flesh at His Second Coming. Beware of the man, who declares himself to be the Son of Man, who calls you to him, for he will not be from God. My Son will come in the clouds just as He left the earth during His Ascension into Heaven so, too, will it be on the last day. My dearly beloved daughter, always remind those who believe in Me, but who have no idea that My Second Coming draws close, that they must always be alert to the signs which were prophesied in My Father’s Book, for the time which precedes the Great Day. The great apostasy is the first sign. This is when belief in the Truth – the Word of God – disappears and when sin is glorified in every part of the world. The sign for when My Second Coming draws very close is when the great apostasy grips My Church on Earth from within. When you see those who say that they have been appointed by Me to lead My Church on Earth engage in the secular world in order to gain favour, you will know that the changes have begun. When you see the Great Sacrifice – My Crucifixion – being debated and new meanings attached to My Eucharist, you will know that My Church will be cast into the desert. By My Church, I refer to those who do not deviate from the Truth and who continue, as before, to accept the Word of God. My True Church will be thrown out of Rome and will have to endure a number of years of desolation. It will be trampled upon by the heathen and will suffer, but by My Grace, it will remain intact and those brave souls who refuse to desert Me will be given extraordinary Gifts by Me. As the abominable, so called ‘miracles’, healings and gestures of false humility and love for humanity are witnessed in the shell of My Church, the true miraculous interventions by Me will be seen. I will, through My Crusade Prayer Groups, make known to those who scoff and mock them, the Presence of the Holy Spirit. Many miracles will be bestowed upon My Prayer Groups and those who recite the Prayers as a gift to help My beloved disciples cope with religious persecution. The persecution I speak of is mainly a spiritual one. My true disciples, and I mean all Christians, of every denomination, everywhere, will watch in great sorrow when they have to bear witness to the great deceit, which will descend over the Catholic Church. The Catholic Church will embrace the secular world and will declare mortal sin to be no more. Sin will not be acknowledged and in order to deceive the innocents, they will be told that it is not difficult to enter My Kingdom. Confessions will stop in the present format. People will be told to ask for redemption in their own way, and as such, many will not then bother to ask for My Forgiveness. They won’t do this because they will no longer accept that sin is caused deliberately and, because of this, that God will forgive all. This is the error which was foretold and which will lead millions into the fires of Hell and they will be led there by the false prophet and the antichrist. Soon, all pagan feasts and festivals will be integrated within the Catholic Churches everywhere. Pagans and those who hate God will be invited onto the altars in front of the tabernacles. This feast will be declared to be the new form of Communion – all God’s children joining together in order to respect each other’s beliefs and human rights. You, My followers, will be asked to show respect for those who want to destroy My Presence in the Holy Eucharist. You will be accused of being anti-Christian if you do not embrace paganism. This is how you will all be fooled. This is how I, Jesus Christ, will be desecrated. They will do the same in schools, in order to banish Christianity. They will do the same in political circles, when everything to do with Me will be wiped out. No other religion will be targeted with such hatred. Christianity, because it is the Truth, will be destroyed. What you do not realise is, that by becoming willing participants in this wicked desecration, that your souls will be darkened and in time you will forsake your own salvation. Betray Me and I will forgive you. Deny Me and I will forgive you. But, when you desecrate Me and swear allegiance to the beast, you become completely separated from Me and you will find it impossible to accept My Mercy. My dear children, allow the Light of God to descend over you, as the plans to prepare the world for the Second Coming of my Son, Jesus Christ, have been completed. All things will now be according to the Holy Will of God and I ask that you use prayer as your greatest armour, as the battle for God’s children will intensify. Unlike previous wars, the battle for souls will be very confusing, because the enemy will be perceived as the friend, while the true Church of Christ will be declared to be the enemy. How strong you will need to be, if you are to become a true Christian soldier. You must never bow to pressure to utter the profanities, which you will be asked to participate in, in public and before the altars of my Son. When you see men elevated to positions of power, in my Son’s Temples, and who demand that you bow in reverence before them, but where there is no sign of the Cross, then run, for you will be drawn into error. You will know that the time for the antichrist to enter my Son’s Church has arrived, when the tabernacles have been adjusted and, in many cases, replaced with wooden versions. Children, please be aware that many of you will turn your backs on the Truth, because you will find the Truth almost impossible to accept. The days leading up to the arrival of the antichrist will be days of great celebrations, in many churches, of all Christian and other denominations. All the rules will have been changed; the Liturgy recreated; the Sacraments tampered with; until, finally, the Mass will no longer be celebrated according to Holy Doctrine. By then and on the day the antichrist sits proudly on his throne, the Presence of my Son will be no more. Then, from that day onwards, it will become difficult for those who love my Son to remain loyal to Him, as they should, because every abomination will be presented before you. When enough distractions surround you and when it will become an offense to question the new hierarchy, you will be tempted to give up and accept the one world religion, for fear of losing friends and family. God’s Army – the Remnant – will grow and spread and the Crusade Prayers will provide great strength to all. My Son will intervene and carry you through the challenges, which lie ahead and you will know that it will be His Power that will give you courage and perseverance. For only the strong amongst you will remain true to the Holy Word of God, but even if the Remnant Army is but a fraction of the size of the army of the beast, God will fill it with the power of a lion. He will strengthen the weak and give them great Graces. He will weaken the power of those who will become devotees of the antichrist. All of these events will seem frightening, but, in truth, these events will seem to many as a new era of unity and peace in the world. People will applaud the new one world church and say: “what a great miracle has been created by God.” They will be in great awe of the men, both from within the church and from outside of it, who have brought about such unity. Great praise and honour will be lavished upon these men and then they will be greeted by loud chanting, as well as a special sign of recognition, in every public gathering. There will be rejoicing, celebrations and honorary ceremonies, where heretics will be awarded great accolades. You will see great wealth, unity among different creeds and men of honour being treated like living saints – all except one. The one I refer to is the antichrist and they will believe that he is Jesus Christ. My dear children, be on your guard for the signs of the times, when the antichrist will take his seat in my Son’s Church on earth, so that this will be clear for you to see. Do not believe, for one moment, that the antichrist will stride into my Son’s Church and take it aggressively, by force. Inspired and driven by the deceiver himself, the antichrist will take up position because he will be invited to do so. All the adjustments in the Church’s missals will be made known soon and the reason given will be they reflect a modern world, so they must become inclusive, in order to suit other denominations and religions. Once the True Word of God and Teachings of my Son, Jesus Christ, are changed, they will become barren, for they will not reflect the Truth, given to the world by my Son. The antichrist will become popular because of his political skills first. Then he will turn his attention to various religions, but his main focus will be on Christianity. Christ is his greatest enemy and the object of his hatred, and so his ultimate goal will be to destroy my Son’s Church. The Church will be dismantled in different ways before he, the antichrist, will be asked to become involved. He will be involved with the decision making in the plan to launch a new one world religion. All these changes – where the Church, having publicly called for the unification of all religions – will take place before the antichrist takes up his seat on my Son’s Throne on earth. Then the path will be cleared for the beast to walk freely in my Son’s Church where a place of honour will be accorded to him. Eventually, it will be announced that he will become the leader of the one world order and a lavish coronation will take place. This event will be seen all over the world, attended by politicians, dignitaries and celebrities and when the crown is placed on his head, it will be as if the final nail has been driven into the Body of my Son. On that day the Catholic Church will be desecrated and many bishops and priests will flee, because they will, by then, understand that the prophecies foretold have unravelled before their eyes. From that day forward, when the Seat of God has been presented to the antichrist, he will display great physical signs, which will convince people of his holiness. The antichrist will, they will say, display the signs of the stigmata and he will be seen to cure the sick and the terminally ill. Great miracles will be attributed to him and he will convince many, in time, that he is Jesus Christ and that his elevation to the top of this false church, is a sign of the Second Coming. And while the laity may have been responsible for establishing the kernel of the remnant church, that which is left of the Church established by my Son on earth, it will be the priests who will lead it from this time onwards. The Holy Spirit will sustain the True Church, during the reign of the antichrist and he, and every enemy of my Son, will never prevail against it. The Truth will never die. The Word of God, while desecrated, will never die. The Church can never die, though it may be flung into the wilderness. Even at its weakest hour, life will still remain, and no matter how much my Son’s Church is attacked, God will never permit it to be destroyed. During those days ahead you must never allow yourselves to be swayed into accepting such deceit. You will be seduced by the antichrist, and he will be endorsed by the enemies of my Son’s Church. He will be embraced by false leaders in the churches and proclaimed for his charitable works, the world over. He will receive great honours in many countries and people will have framed photos of him in their homes. He, the antichrist, will be idolised more than God but it will be by the Hand of God that he will be thrust into the abyss along with those who stole the souls of God’s children when they participated in the attempted destruction of my Son’s Church. My child, how Christians will suffer as the disease of sin engulfs the world everywhere in many guises. There is an organized attempt being made to wipe out Christianity and this takes many forms. You will know that when Christians are denied the right to publicly declare their allegiance to God, that every other creed, not of God, will be permitted to do so. These other creeds will be given great support when they plead for justice, in the name of their rights as citizens. What this will do is to spread further the sins which are abhorrent to my Father. People will be forced to accept sin in their countries and it will become an offense for Christians to object to these laws. Christians will be viewed as being uncharitable, right wing and out of touch with the human rights of others. Every trait, desirable in souls, as laid down by my Father, will be used as a front in their efforts to justify such wickedness in your nations. When disease of the flesh grips a community, it kills many. But, after a time of great sorrow and many deaths, the remaining community becomes immune to the disease. Sin will cause disease of the flesh in many nations, as the judgements of the Seals are declared by the Saviour of humanity and poured down by the angels of the Lord. Many will be killed in atonement for the wickedness of man. This purification will continue until there will remain only those who are immune to death because of their love for God. Christians will suffer greatly in a number of ways. Their faith will be taken away from them and in its place an abomination will be witnessed. Their pain, which has already begun, is the same as that experienced by my Son, at this time. Then, they will have to witness an astonishing sight, as the antichrist, upon his announcement, will declare that he is a devout Christian. He will use many extracts from the Bible in his speeches to the world. Weary Christians, who suffered up to this, will suddenly be relieved. At last, they will think, here is a man sent from Heaven in answer to their prayers. Out of his mouth will spill many sweet and comforting words and he will appear to be a godsend, in that he will be seen to amend the wrongs against Christians. He will carefully construct how he is perceived by Christians and especially Roman Catholics, for these will be his main target. All will admire the antichrist and his so-called christian acts, gestures and his perceived love of Holy Scripture will make him instantly acceptable by many. He will draw all nations together and set about holding ceremonies for other religions and, in particular, pagan organizations, so that they can work together to bring about world peace. He will succeed in uniting countries, which had been enemies up till then. Silence will be heard in war torn countries and his image will appear everywhere. His final, great achievement will be when he brings all those nations he unites, into the domain of the Catholic Church and all other Christian denominations. This unification will form the new, one world religion. From that day forth, Hell will break loose on Earth and the influence of demons will be at its greatest level since before the great flood. People will be seen to adore God in the new, one world order church and appear to be devout in every way. Then outside of the churches they will indulge in sin openly, for no sin will shame them. Under the hypnotic direction of the false trinity – the trinity created by Satan – they will crave every kind of sin as a means to sustain their new-found appetite. This wickedness will include sins of the flesh, where nakedness will be acceptable, as man will become involved in obscene sins of the flesh in public places. Murders will be common and committed by many, including children. Satanic worship and black masses will take place in many Catholic Churches. Abortion will be seen as a solution for every kind of problem and will be permitted right up to the day of birth. It will soon become a criminal offence to show any kind of allegiance to Jesus Christ. If you are seen with a true Cross you will find that you have committed an offense, because you will be breaking the law. The law in your lands will become a dual law – where politics and religion will be entwined in the new world order. This persecution will mean that many, unknowingly, will adore the beast and become infested. So infested will they become that they will betray brother, sister, mother and father, to the authorities, if they should remain loyal to Christianity. Your only hope, children, is prayer to sustain you through this period. I urge you to keep all holy objects, rosary beads, blessed candles, holy water, a copy of the Bible and the holy daily Missal along with the Crusade of Prayer book. You must keep the Seal of the Living God in your home and on you if possible. My Medal of Salvation will convert those who wear it and they will be shown Mercy by my Son. I now request you, child, to have the Medal of Salvation produced now and a Scapular of the Seal of the Living God made. This Message is a warning from Heaven of things to come. You must listen to me, the Mother of Salvation, as I must guide you to the Truth, so that you will remain truly faithful to my Son at all times. Go in peace, children, and be calm as this trial will, because of the Mercy of God, be short. Trust in me, your Mother, as I will be with you always during your trials. You will never be alone. My dearly beloved daughter, My Time is close. The closer the Great Day draws, the more signs will be witnessed in the world. The man they will reveal to the world as the ‘man of peace’ is preparing to imitate Me in every conceivable way. He knows the Holy Scriptures inside out and, because of his parentage, will utter the Words back to front, so that their meaning is inverted. Out of his mouth will pour the blasphemies, the heresies, the lies and the desecration of My Word. He will impress everyone with his knowledge of all things Sacred. He will recite extracts from My Teachings, which he will passionately proclaim from every secular stage in the world, until people sit up and take notice of him. Many will say: “Who is this man who speaks with such wisdom? Who is he who calls out to the world with love in his heart for the masses? Is he the Lord God, Jesus Christ?” they will ask, when many miracles will be attributed to him. And when he walks upon the altars with My other enemies, who will be dressed as holy servants of God, he will be fully accepted by both divisions in the world – the true believers and the heathen. He, the antichrist, will twist the Truth and declare the lie that he is Me and that he comes to bring you salvation. The lie will be declared that he comes in the flesh. He will never allude to Jesus Christ – Who came in the flesh – by His death on the Cross, for this is impossible. No, he will declare the fact in reverse. He will say that he has come, finally, at this time, in the flesh. Many will believe him to be the Christ. He, the antichrist, will speak many languages, but not one word of Latin will come from his lips. The beast will be idolized, while I, the True Saviour of the world, will be forgotten and My Word trampled upon. You must never believe the lies, which will be uttered by the beast, when he sits proudly in the temple set up to honour him. My child, were my Son, Jesus Christ, to walk the Earth at this time, He would be assassinated. No official in His Church would accept Him. He would become a laughing stock, then feared and so despised that they would have Him crucified, just as before. This time my Son comes in Spirit only and by the Command of my Father, He will not appear on Earth as a man, in the flesh. I urge that this Message is made clear to all, for many will come in His Name, but one of them will rise to prominence and say that he is my Son, but this will be a lie. The antichrist will rise and become so powerful that his image will be seen everywhere. Statues will be erected in his image and his face will appear constantly on news and television screens around the world. He will be applauded by the most powerful leaders, but it won’t be until he is openly welcomed and then endorsed by the false prophet that he will truly exert his influence over humanity. Were my Son to make Himself known in the flesh again and command attention, they would destroy Him. The antichrist will, however, be welcomed into the world and be mistaken for Jesus Christ. Every Word contained in the Bible, regarding the Second Coming of my Son, will be adapted and twisted, in order to convince the world that they are witnessing the return of Jesus Christ. The enemies of my Son, who mingle with those innocent servants of His in my Son’s Churches everywhere, will be led into grave error. Their leaders will embrace the antichrist and encourage souls to idolize him. His influence will shock many who remain faithful to God and it is important that you safeguard your souls against his hypnotic appeal. The Medal of Salvation, when carried upon your person, will, along with the other Graces it promises, safeguard you against the power of the antichrist. Make no mistake, the antichrist will enthrall many and he will be seen as the most powerful, popular, charismatic and influential leader of all time. Many will believe the antichrist to be a very holy man and, because of his links to my Son’s Church, people in their millions will convert to what they will believe to be the Truth. This false exterior of holiness will bring tears of joy to all those who have had no faith in their lives up to then, nor belief in God. They will lavish praise upon this man and give him the credit for saving their souls. At first, the antichrist will be seen as a great leader with an appealing, charming and lovable allure. Then in time, he will start to exhibit healing powers and many people will come forward and claim to be healed by him. Many will also claim to witness miracles in his presence. Then a series of false apparitions, in which the image of the sign of the Holy Spirit will be seen, will appear everywhere. The media will create a godlike image of him and very few will dare to publicly rebuke him. Because of his command of many languages, he will fool millions in a very short period of time. Then, the rumours that Jesus Christ has come back a second time, will begin. These will be fuelled by those who will work tirelessly for the antichrist by spreading lies, until eventually he will be mistaken for my Son. All of these events sound far-fetched now, but when they all unravel before you, it will seem like a natural series of events, which will be seen by many as uplifting. Then, just as every evil falsity is presented to the world back to front by Satan – the antichrist, through satanic rituals, will be seen to ascend into Heaven. My Son, on His return, will be seen descending upon the clouds – the reverse of when He ascended into Heaven – just as He promised. Then, the antichrist and all those who slavishly adored him will be thrown into the lake of fire and peace will be yours, dear children. For all those who remain loyal to the Truth, they will, in the blink of an eye, be raised into the New Paradise, when Heaven and Earth become one. My dearly beloved daughter the antichrist is preparing, already, his peace plan which he will introduce soon after the wars become widespread in the Middle East and when the pain and terrible anguish means there is no sign of hope. Then he will appear suddenly and announce himself to the world as a man of peace, a bright jewel which will sparkle in the midst of darkness. As he emerges he will be seen as one of the most charismatic political leaders of all time. His handsome, appealing and caring personality will fool the majority of people. He will exude love and compassion and will be seen to be Christian. In time he will draw many followers who will grow in their numbers so that he becomes like Me, the Messiah. He will be seen to promote unity among all nations and he will be loved in almost every country in the world. Then he will be seen to have supernatural skills. Many will believe that he has been sent by My Father and that he is Me, Jesus Christ, Saviour of the World. They will pray to him, love him, give up their lives for him and he will laugh and mock them when they cannot see him. This will be the biggest deception of all time and the plan is to steal your souls, to take you away from Me. He and the False Prophet, who will sit like a King in the Seat of Peter, will secretly plot a one world religion. This will appear to be a Christian type religion which promotes love. It will, however, not promote love of one another which comes from God. Instead it will promote love and allegiance to the antichrist and love of oneself. The abomination does not stop there for when they have seduced God’s children the attack will begin. Suddenly all will be asked to accept the one world Mark of Allegiance. A united world which all men will have to partake in. It will control your money, your access to food and how you live. Rules, many of them, will mean that you will become prisoners. The key to your cell, which keeps you under their control, will be the Mark of the Beast. 666 will be embedded, its number hidden, into a chip which you will be forced to accept just as you would any vaccination. Once embedded it will poison, not only your mind and soul, but your body. For it will cause a plague designed to wipe out much of the world’s population. You must not accept the Mark. Instead I will instruct you what to do. Many will accept the Mark because they will feel helpless. The Seal of the Living God, My Crusade Prayer (33) is your lifeline. When you receive My Seal of Protection, given to you by My Eternal Father, you will not have to accept the Mark. You will not be touched. Your home will not be seen, searched or a target for it will be rendered invisible in the eyes of Satan’s army. You will need to keep food hidden which will last a few years. You will need to grow your own crops, store your own water and keep all Holy objects around you. My Remnant Church will grow and spread out and you will be given shelter if it is needed. Much planning is needed now. Those who laugh at what you do, or say, surely Jesus would not ask you to do this? Does He not supply all His followers at their time of need? Even one loaf and one fish can be multiplied. So it does not matter if you only have some food for I will protect you and you will be safe. Pray hard for those souls who will be unable to avoid the Mark. Those innocent souls will be saved who are in a state of grace at the time of being forced to accept the chip. The rest of you must plan to protect your family and your allegiance to the Holy Eucharist and the Mass. When the antichrist devours all religions the only weapons which he will be powerless against is the Holy Mass and the Transubstantiation of the bread and wine into My Body and Blood, in the Holy Eucharist. My Masses must continue. Those of you who know this must gather in numbers now and start the preparations. The sooner you prepare the more graces you will be given to grow your ranks around the world. The Rock will become laden with a new building which they say will be My New Temple. But this is untrue. But when the persecution ends My Remnant Church and My Chosen People will have the Temple rebuilt and My New Jerusalem will come down from Heaven. She will descend in glory. The trumpets will be heard in Heaven and on earth at the same time. And then I will come. You, my daughter will herald my arrival and many will fall on the ground and weep with relief, love and joy in ecstasy. For, at last the moment they have been waiting for. The skies will light up, the thunder will peal and the choirs of angels will sing in sweet unison as all God’s children will welcome the True Messiah. I, Jesus Christ, will come to judge. And the Heavens and the Earth will become one. The New Glorious splendour, the renewed earth, will emerge and the New Paradise will embrace all those whose names are in the Book of the Living who will unite as one. And while the end of the old earth, soiled with the stain of sin, will have come to an end the New Era is only beginning. This is what you must strive for. This is what you are entitled to as part of your natural inheritance. Only focus on the saving of all souls. This is why you must ignore the obstacles presented to you. The persecution. The pain. The horror of evil by the hands of others. All that matters is the saving of souls. God the Father - "My children, yesterday the Christian world suffered a great loss in the burning of the Notre-Dame Cathedral in Paris"